the stemlike portion of the brain connecting the cerebral hemispheres with the spinal cord, and comprising the pons, medulla oblongata, and midbrain; considered by some to include the diencephalon. Also written brain stem. Originally, the entire unpaired subdivision of the brain, composed of (in anterior sequence) the rhombencephalon, mesencephalon, and diencephalon as distinguished from the brain's only paired subdivision, the telencephalon. More recently, the term's connotation has undergone several arbitrary modifications: some use it to denote no more than rhombencephalon plus mesencephalon, distinguishing that complex from the prosencephalon (diencephalon plus telencephalon); others restrict it even further to refer exclusively to the rhombencephalon. From both developmental and architectural viewpoints, the original interpretation seems preferable. (brān´stem″) the stemlike portion of the brain connecting the cerebral hemispheres with the spinal cord, and comprising the pons, medulla oblongata, and midbrain; considered by some to include the diencephalon. the portion of the brain comprising the medulla oblongata, the pons, and the mesencephalon. It performs motor, sensory, and reflex functions and contains the corticospinal and reticulospinal tracts. The 12 pairs of cranial nerves from the brain arise mostly from the brainstem. Compare medulla oblongata, mesencephalon, pons. The central stalk-like axis of the lower CNS, which connects the brain with the spinal cord. • Reticular functions, integrating cardiorespiratory control, arousal and alertness, consciousness. Originally, the entire unpaired subdivision of the brain, composed of the rhombencephalon, mesencephalon, and diencephalon as distinguished from the brain's only paired subdivision, the telencephalon. More recently, the connotation of the term has undergone several arbitrary modifications: some use it to denote no more than rhombencephalon plus mesencephalon, distinguishing that complex from the prosencephalon (diencephalon plus telencephalon); others restrict it even further to refer exclusively to the rhombencephalon. From both developmental and architectural viewpoints, the original interpretation seems preferable. 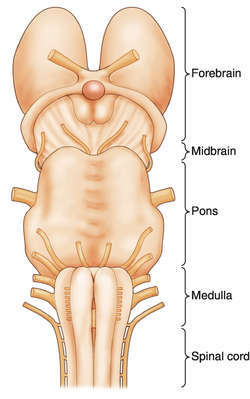 The part of the brain consisting of the medulla oblongata and pons, which connects the main brain (cerebrum) to the spinal cord. The brainstem contains the ‘vital centres’ for respiration and heart-beat and the nuclei of most of the CRANIAL NERVES as well as massive motor and sensory nerve trunks passing to and from the cord. n the portion of the brain comprising the medulla oblongata, pons, and mesencephalon. It performs motor, sensory, and reflex functions. The latencies and amplitudes of the brainstem waves of AEP are called the auditory brainstem response (ABR). The auditory brainstem implant procedure is said to be the only effective sensory prosthetic for direct brain stimulation in cases that do not benefit from traditional methods like hearing aids or cochlear implants (CI). A tiny device has now been fitted onto his brainstem where sound is processed. Awareness of this new entity helps to differentiate this disease process from other brainstem disorders. CTs with cerebellar and/or brainstem alterations were observed in 13 (29%) cases: hypodense areas in nine cases and cerebellar atrophy in five cases (one case simultaneously had hypodense areas in the cerebellar white matter and cerebellar atrophy). According to our case\'s treatment, Mg is also effective in treatment of ANE without brainstem lesions. And lack of brainstem function is death in the UK but not anywhere else. Brainstem CMs are particularly challenging to resect because they occupy the most eloquent territory of the brain. The relapsing symptoms (migraine-like headache, right-sided trigeminal hypaesthesia, vertigo, nystagmus, body lateropulsion, nausea and vomiting) were fully attributable to the MRI brainstem lesion (Figure 1A). Superficial siderosis describes the hemosiderin deposition on the surface of the brain, brainstem, cranial nerves and spinal cord following recurrent subarachnoid haemorrhage. 1 Journal of the American Medical Association, the study found that infants who die of SIDS have abnormalities in the brainstem, a part of the brain that helps control heart rate, breathing, blood pressure, temperature and arousal. SIDS research bolsters call for "back to sleep"
Ascending transtentorial herniation, significant mass effect, distortion of the brainstem and fourth ventricle, moderate supratentorial ventricular dilatation, and associated sulcal/meningeal enhancement occurred.